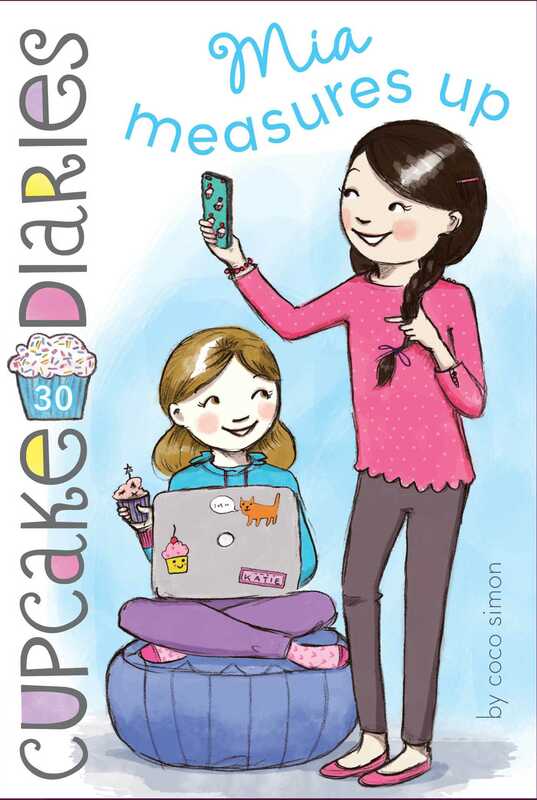 Mia is being cyber-bullied, and she’s determined to find out who is responsible in the latest addition to the Cupcake Diaries series. Mia is upset when her parents tell her she’s too young to go to a concert without adult supervision. She’s old enough to help run a cupcake business! Why can’t her parents see that she’s also responsible enough to do whatever she wants? And just when she’s reached a compromise with her parents (her older brother Dan will go to the concert with her), Mia finds out she’s being cyber-bullied on social media. It’s the Cupcake Club to the rescue as they all help Mia solve her online bullying mystery! I shouldn’t have eaten that third corn dog,” my friend Katie Brown moaned. We were strapped inside a round blue chair on an amusement park ride, and we just kept spinning . . . spinning . . . and spinning. . . .
“Don’t puke on me! I just got these sneakers!” I warned her, laughing, and I saw Katie’s knuckles tightly grip the bar in front of us. “Don’t say that word!” Katie yelled. Luckily for both of us, the ride slowed to a stop. Katie and I climbed off. My legs felt wobbly. It was a beautiful twilight, and Katie and I were with our friends Alexis Becker and Emma Taylor at the Maple Grove Carnival. The four of us own a business together, the Cupcake Club. A few weeks ago Alexis had submitted a vendor application to the carnival so we could sell our cupcakes there, and they’d accepted us! “Even the Whirling Twirler?” I asked. “Yes,” Katie insisted. “In fact, I could go for another corn dog about now.” She started looking around. “Absolutely not!” I said. I grabbed her by the arm and started running toward our cupcake booth. We were both laughing so hard that I bumped right into someone. Luckily, it was someone we knew from school—George Martinez. “Hey! The bumper cars are over there,” George said, pointing. “Ouch! You’re jabbing me with your pointy elbows!” George teased. Katie and George are friends—the kind of friends who would be boyfriend and girlfriend if they were old enough to go on dates. So they’re not boyfriend and girlfriend, but they do hang out together sometimes. “And we’d better get back to the table,” Katie said. Normally, I’m not a person who teases, but George teases everybody all the time (well, mostly Katie), so I thought I should dish it back to him for once. Our little booth wasn’t far away. My stepdad, Eddie, had set up a tent for us, and the park had provided everyone with tables. Ours had a pink tablecloth with our cupcake logo on the front. Emma was handing a cupcake to a customer, and Alexis was putting change into our cashbox. “How are we doing?” Katie asked after the customer had walked away. “We’ll sell the last hour, if you two want to go do the rides,” I said. Emma looked at Alexis, and they both nodded. “Whatever you do, don’t eat three corn dogs before you go on the Whirling Twirler,” Katie warned them. “Not my smartest decision,” Katie replied. “Mmmm, funnel cake,” Katie said, and then she put her arms out in front of her and started to zombie-walk toward the funnel cake stand. We turned to see my cousin Sebastian and my stepbrother, Dan. Sebastian was the one who had called us the Cupcake Sisters. “We’re the Cupcake Club, not Cupcake Sisters,” I told him. “But you look like sisters,” he said. I shook my head. Katie, Alexis, Emma, and I don’t look anything alike. I’ve got stick-straight black hair and dark brown eyes. Katie’s got wavy, light brown hair that matches her eyes. Emma is blond haired and blue eyed, and Alexis is a green-eyed redhead. “Just because we’re all wearing the same T-shirt and we all have our hair in ponytails doesn’t mean we look like sisters,” I said. “Yeah, he’s, um, entitled to his opinion,” Emma said awkwardly, and then she blushed a little bit. Katie and I got behind the table, and Dan reached for a chocolate cupcake. “That’ll be three dollars,” I said. Dan rolled his eyes and fished in his pocket for the cash. Katie took it from him. Sebastian is a freshman in high school, and Dan is a senior. Sebastian moved here a little while ago from Puerto Rico, and he and Dan bonded over heavy metal music, so they hang out all the time now. Then Dan and Sebastian walked off, and Katie started hawking our cupcakes. “Homemade cupcakes here! Get your maple walnut cupcakes!” she yelled. A couple came over right away, and each of them bought a maple walnut cupcake. “Keep going, Katie. It’s working,” I told her. Katie moved to the front of the table. “Get your cupcakes here!” she sang, and then she busted out some crazy dance moves. “Katie, what are you doing?” I asked. “This is my happy cupcake dance!” she replied. At that moment a group of girls walked past our booth. To be more specific they were the girls in the BFC (the Best Friends Club): Callie Wilson, Maggie Rodriguez, Olivia Allen, and Bella Kovacs. “Nice dance, Katie,” Olivia said in the most sarcastic voice possible, and the other girls giggled. “Thank you!” Katie replied, still dancing. Most of us had learned to just ignore the behavior of the Best Friends Club. Callie broke away from the others. “I’ll have a chocolate cupcake, please,” she said. Now, maybe Callie just wanted a cupcake. Or maybe she did it because she and Katie used to be best friends before middle school, and I know that Callie feels bad when the other BFC girls are mean to Katie. Either way, it was nice of her. I handed Callie her chocolate cupcake and then checked my phone. I quickly made my way to the stage area, where all the announcements had been made throughout the day. It was almost dark now, and the park lights were shining. I got to the stage just as some members of the high school music club were getting to the microphone. I quickly took my ticket out of my pocket. “We’d like to thank everyone who purchased a raffle ticket today. All proceeds are going to the music club,” a girl was saying. I stared at the ticket in my hand: 306978. The numbers were right there in front of me. I couldn’t believe it. I’d won! I ran up to the stage. “I think I have the winning ticket,” I said, handing it to the girl. I still couldn’t believe it was true. She and the boy checked the numbers. Then the boy handed me a white envelope. As I raced back to tell Katie the good news, I passed George. He gave me the evil eye, but I knew he was only kidding. “Sorry, George. Life happens,” I told him, and then I ran back to the cupcake booth. I couldn’t wait to tell Katie. “Katie! I won! I won the tickets!” I yelled, waving the envelope. “You’re coming with me, right?” I asked. “And I won’t really understand the words,” Katie went on.